Mauget’s Liquid Loadable STEMIX® PLUS is a water based fertilizer for use with most all liquid loadable injection systems. An optimum formulation of chelated minerals with a very low salt index and elevated magnesium and calcium, designed to stimulate both foliar and root growth. 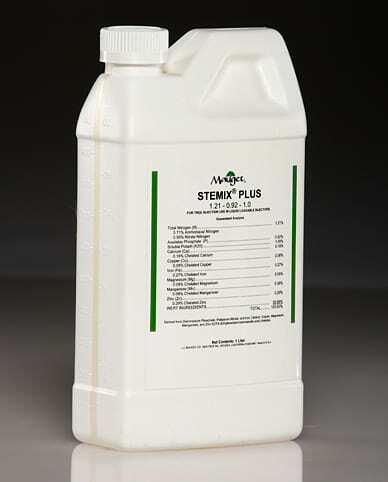 Stemix Plus is for use in trees where deficiencies cannot be successfully corrected by foliage or soil feeding, and in areas where leaching into ground water is a concern. Because the elements are placed directly into the trees vascular system, the benefits of Stemix Plus can be evident for one to five years compared to adjacent untreated trees. Benefits of Stemix Plus can be evident for one to five years compared to adjacent untreated trees.